The first step of the recipe sounded simple– prep the apples by cutting off the ends, then cutting them in half. And it was simple. Just extremely tedious. 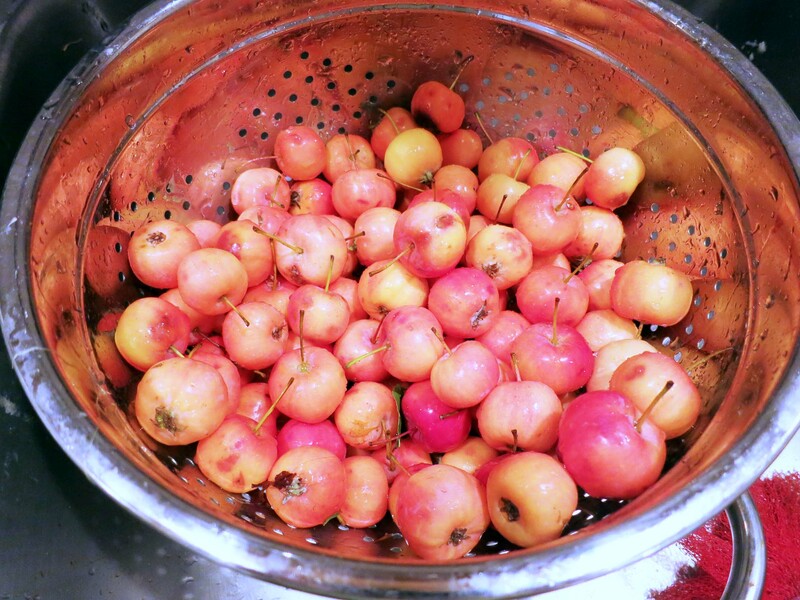 I had just over two pounds of teeny tiny apples, and it took forever to get them all prepped. I can’t imagine how annoying it would’ve been to prepare the six pounds of apples most recipes called for. 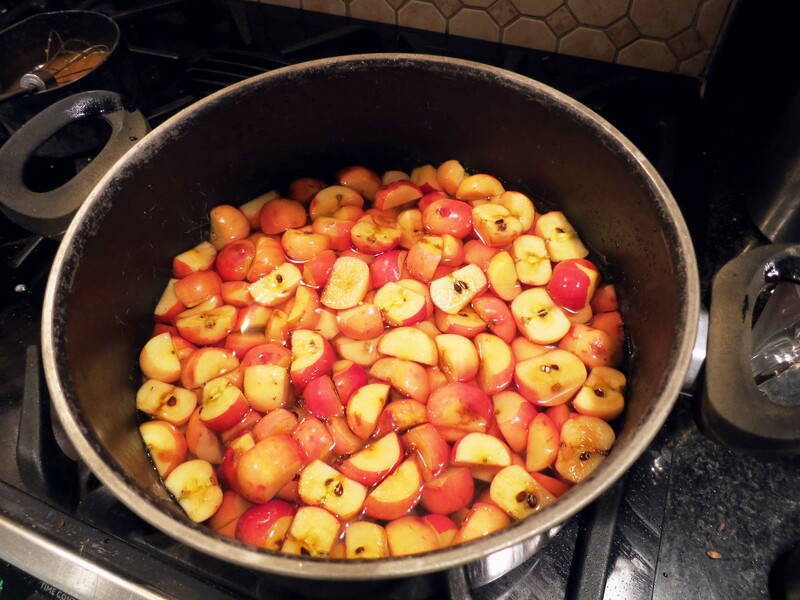 Next, I was supposed to put them in a pot, add just enough water to cover them, and then boil them until soft. Fine, that was easy. It took about half an hour until they were soft all the way through. 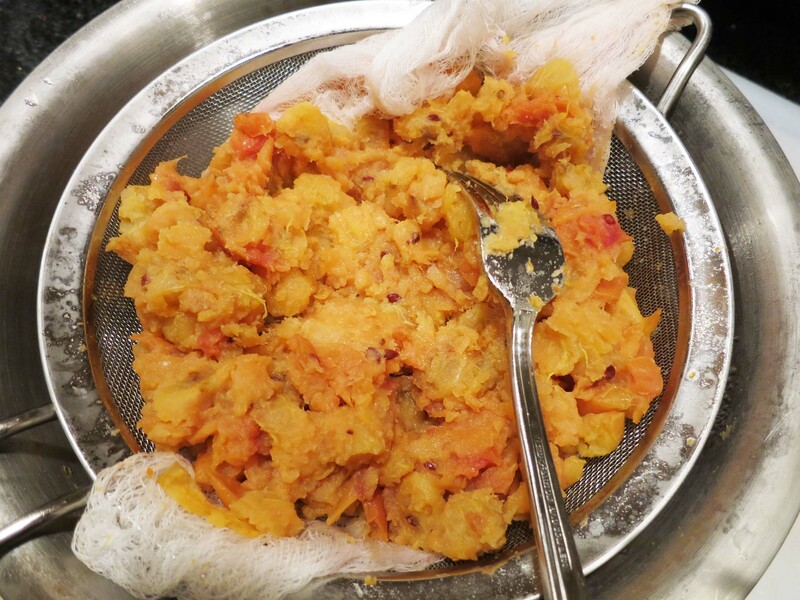 The recipes were not helpful, so I took a chance and poured off most of the cooking water (which was looking awfully juice-colored at this point, which should’ve been a clue), then transferred the wet apples to a cheesecloth-lined mesh strainer. And waited. I gamely kept on with the process, mashing up the apples a little to get them to release more juice and letting the whole thing sit in the fridge all night. 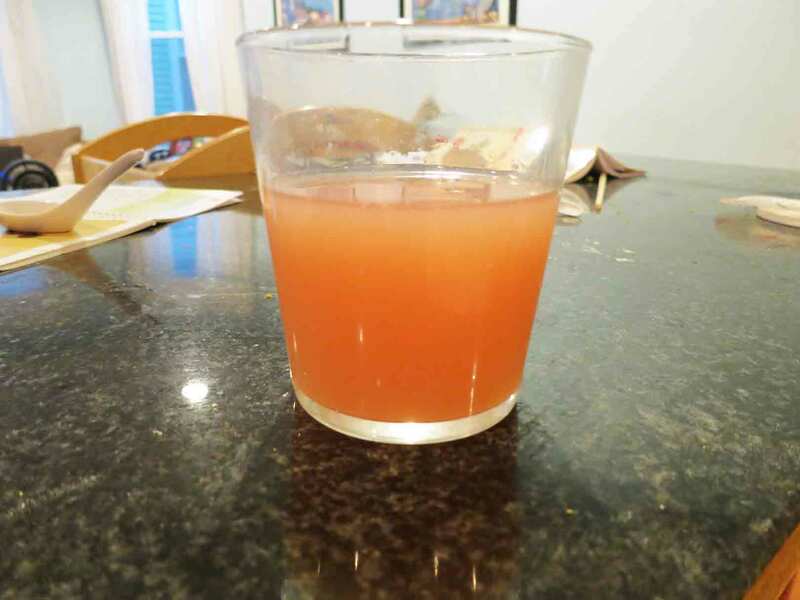 I ended up with about a cup of juice left (glad I’d only partially drained off the water), and figured that I could at least make a single small jar of jelly to get something out of the experience. I poured my single cup of juice into a small saucepan and added sugar, then started boiling away. 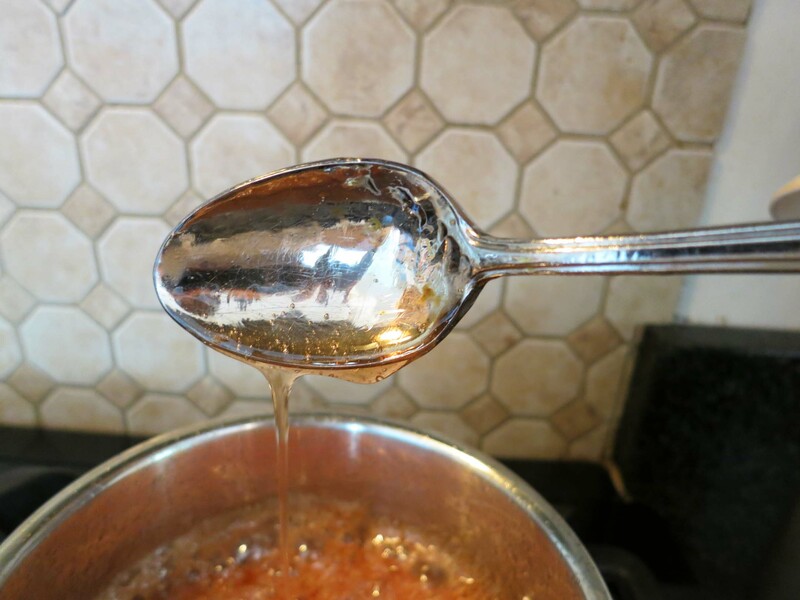 The recipes indicated that the jelly would be set once it “sheeted” off of a cold spoon, rather than dripping in tiny, fast drops, so I kept dipping an ice-cold spoon into the hot jelly, waiting for it to do anything other than drip. It never did. Finally, I got tired of waiting and proclaimed that the slightly slower drips were the equivalent of sheeting, and called it done. 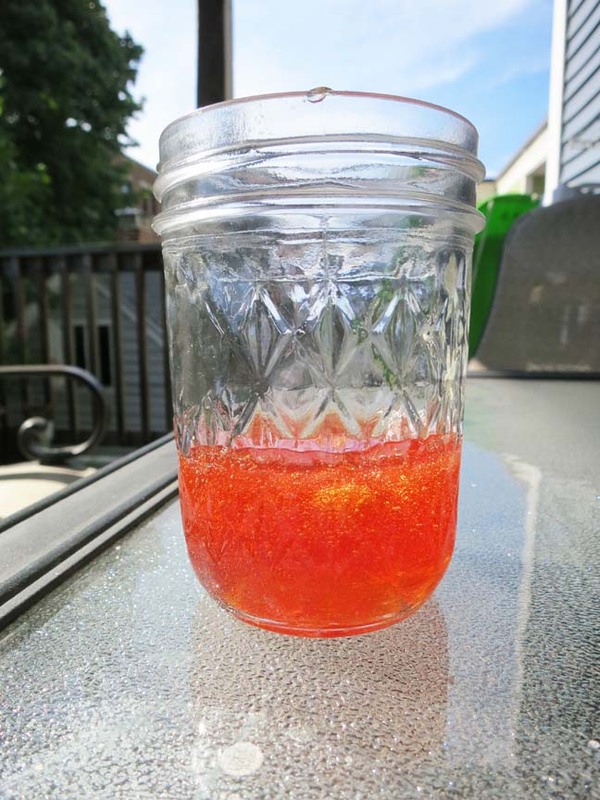 I poured the scant 1/3 cup of jelly (it reduced a lot, which perhaps should have been a clue) into a mason jar, and put it in the fridge. About an hour later I noticed that the spoon was firmly stuck to the still-sticky pot, both of which were in the sink. Cautiously, I tried to pull it off… no luck. And that was room-temperature jelly… I went to check the jar in the fridge.